The new Cadillac sedans are expected to be named CT5 and CT4. Pictured is a heavily camouflaged Cadillac CT5. General Motors is investing C$232 million (US$175 million) in a mid-Michigan plant to build two of Cadillac's next-generation sedans, but the automaker is not saying how that will affect production at its Oshawa, Ont., assembly plant. GM, according to a spokeswoman, has already begun installing new tooling and equipment at the Lansing Grand River Assembly Plant, which now builds the Cadillac ATS compact and CTS midsize cars and Chevrolet Camaro. The new Cadillac sedans -- expected to be named CT5 and CT4 -- will eventually replace the ATS, CTS and XTS large sedan in Cadillac's car lineup. 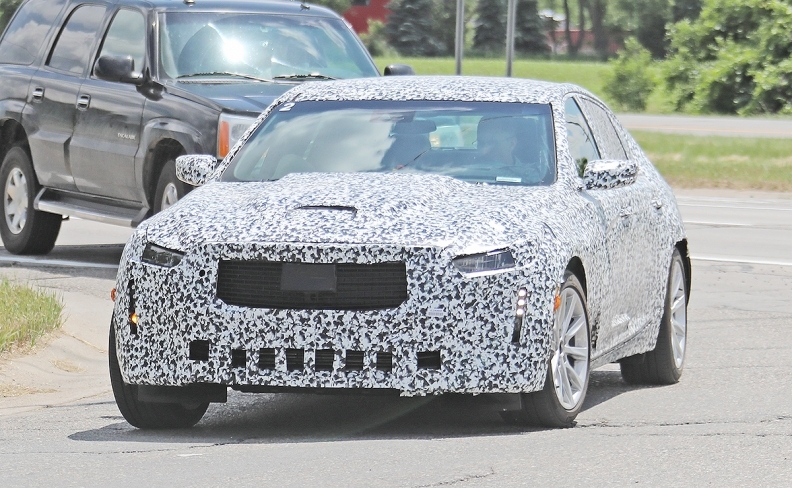 The XTS is assembled alongside the Chevrolet Impala on a flex line in Oshawa, Ont., but Canadian officials remain mum on the line’s future. "Our production plans have not changed in Oshawa. The Oshawa Assembly plant currently builds the Cadillac XTS and Chevrolet Impala on the flex line and we don’t comment on future product speculation," was all GM Canada spokeswoman Jennifer Wright would say when asked how the Michigan investment might affect Canadian operations. GM finishes 2018 model-year double cab Chevrolet Silverado and GMC Sierra truck bodies shipped to Oshawa from Fort Wayne, Ind. A C$500-million investment announced during 2016 contract talks with the union Unifor allows Oshawa to build light trucks on one of its lines and cars on a flex line, making it the only plant in North America that builds both cars and trucks. However, about 600 workers are on layoff while the plant continues to run just one shift on the flex line building the XTS and Impala. GM plans to discontinue Cadillac ATS sedan output after the 2018 model year. Production of the CT5 is expected to begin in 2019, followed shortly after by the CT4. The two cars are part of an extensive overhaul of the brand's lineup that will include a new vehicle, on average, every six months through 2021. The latest investment comes two years after GM invested C$280 million (C$211 million) to support tooling and equipment and a 32,000-square-foot addition to the body shop for future Cadillac sedans. GM has spent $464 million in manufacturing for Cadillac vehicles in the past two years. Other major investments have taken place to expand Cadillac Escalade capacity and build the first-ever Cadillac XT4 and XT5 crossovers. The new crossovers are expected to boost Cadillac's U.S. sales, which fell eight per cent in 2017. Globally, Cadillac sales -- led by China -- increased 16 per cent to 356,467 last year. Canadian sales were up 9.6 per cent to 13,330 units in 2017.